Effect units are as common in recording studios and on stages as instruments are. Usually there are specialist units that excel at one specific task and multi effects units that are capable of providing several effects. These units often combine reverb, delay and technically related effects like chorus and flanger. 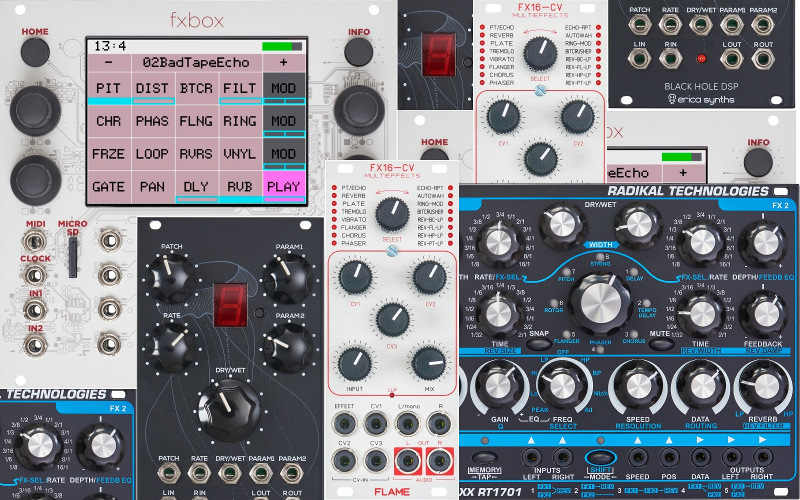 In eurorack it is also possible to find these versatile digital effects units that open up new dimensions of sound – because you can control them with CV, other than their predecessor. But why are there (mostly) the same few effects in most units? Why is it harder to find an effects unit with compressor, saturation, reverb, delay and ring-modulation? Well, there certainly are effect units, mostly outside of eurorack format, that feature all these effects in one housing. But if you are looking, for example at distortion and compressor effects, there might be a simple reason for making them analog – it is easier to make and sounds better. This is not supposed to be a discussion about analog or digital, only a description of what seems to be a common thing – reverbs and delays can be designed more diverse and versatile on a digital basis. And analog designs excel at effects like distortion and compression. This definitely is a simplification and generalization – that said, there are of cause brilliant analog delays and reverbs – maybe even the most iconic delays are analog, and there are perfect digital compressors. So why does it make sense to combine reverb, chorus, flanger and delay effects in one unit? Maybe it is because they are all time based effects. This means that they somehow take small bits of audio and play them back delayed in a certain way that is determined by a specialized algorithm. Because the basic idea behind these effects is basically the same they can be combined more easily and share the same user interface. Actually, all this is only guessed and not important, the sound is important. And the little small extra bits of thought that went into the development of a module, which sets one model apart from the others. And these are the things we are looking at now. Therefor we will discuss four different stereo multi effect units in eurorack format. We are starting with a real monster. The RT-1701 is big – due to the different effect sections and one special feature. For the different sections can be set to different combinations, which changes the signal flow. In general you get an input section with a dedicated overdrive circuit, then two effect processors with reverb, several delays, Chorus, Phaser, Flanger, Rotor, String Filter and a Pitch Shifter. 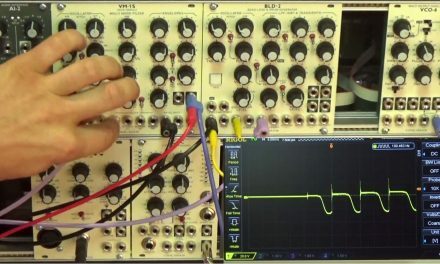 And as if this was not enough, you can utilize the String Filter as a Karpulus Strong oscillator that tracks 1v/oct; all you need to add is noise, an envelope and a VCA. The overall effects quality is superb. The algorithms can compete with high class rack units, are widely adjustable and with the flexible routing you get a variety of possibilities for sound design. A specialty of this module is the so called snap-shot function. The big knob in the middle of the module and the eight LEDs around it represent the effect algorithms and eight memory slots for snap-shots. First it seems like these are only memory slots for your favorite settings, but the magic happens when you start blending from one snap-shot to another. Take a saturated delay and slowly transform it to a mild phaser – and by transform I don’t mean one effect fades out while the other fades in. It is more a morphing from one to the other – and that with up to eight different effect settings in a row – controllable with CV. Put some of the excellent reverb on top and you are most likely creating something lively and gorgeous. The Flame FX16CV is a more simple effects module with a significant smaller footprint and price. It features 16 effects with CV-able effect selection. This alone makes the Flame module interesting and versatile, but you also get three CV-able parameters with each effect. Lots of fun for a good price. And different Flame FX modules are on the market for some time now and have constantly been updated with new functions – the FX16-CV is the most advanced so far. At first glance it seems like you can only use one effect at a time, a closer look reveals this is not really true as most of the effect programs use at least two different effects in a combination with each other. Most feature an additionally reverb or filter effect that adds to the chorus, flanger, tremolo or the other effect types. These combinations make the FX16-CV so powerful. Most times you are using it, it will sound like more than one effects unit and you will soon begin to appreciate the predetermined effect combinations. The Black Hole by Erica Synths follows a similar approach, it is a digital stereo effect processor with 16 custom effects. These are split up into two banks. The different effect programs are called patches, because there is mostly more going on than in a simple delay or reverb. Most of the patch programs come in preconfigured effect combinations, like a delay into a flanger or a high-pass filter with saturator into a reverb. Or they are more complex algorithms, like a granular delay for example. These combinations lead to very expressive results and always provide you with interesting results, especially when modulated! Because it is important to note that every knob on the front panel has a dedicated CV input. And if you like the Black Hole DSP but can’t find room in your rack, there is also the Pico DSP – a 3 hp effect module inspired be the Black Hole DSP. The FXBox is a beats of it’s own. The huge touch screen is a good indicator for where the strong point of this module lays. It is instant fun to play with the different effects just by touching it. It is easy, fast and intuitive. You can activate different effects at different times during a sequence, just like you program a step sequencer. Or activate one or more effects continuously or momentarily while you press the respective area on the touch screen. This might be the most “hands-on” module of the ones we are talking about here. The effects are combinable at will. Each algorithm features up to four parameters, which can be adjusted via the module’s rotary encoders or the touch display. It is even possible to edit several values at once. And once you get bored of the effects (don’t expect that to happen!) you can change the firmware of the FXBox and transform it to a sampler – the Bitbox! Back to Berlin, now ..